Page 6 Their value as human beings does not dissipate with age but in enhanced within the Mexican family many times grandparents bridge the generation gap between their children and their grandchildren. 3. Respect for others. 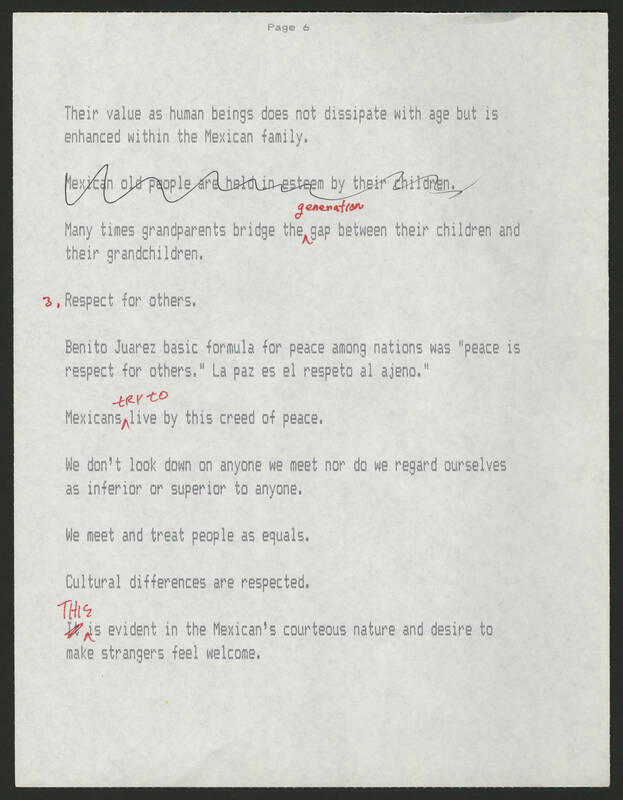 Benito Juarez basis formula for peace among nations was " peace is respect for others" La paz es el respeeto al ajeno." Mexicans try to live by this creed of peace. We don't look down on anyone we meet nor do we regard ourselves as inferior or superior to anyone. We meet a treat people as equals. Cultural differences are respected. This is evident in the Mexican's courteous nature and desire to make strangers feel welcome.